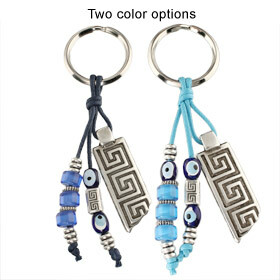 A classy keychain featuring the Greek Key. Next to the Greek Key, strands of decorative blue and metalic beads hang on a thick blue string, afixed to a generous sized key ring. Choose from two color varieties: turquoise and dark blue. (Shades of blue beads and string may vary slightly).